This gun was originally a Miroku-made A-5 20 Mag smoothbore slug gun with a 24 in. barrel with adjustable iron sights. 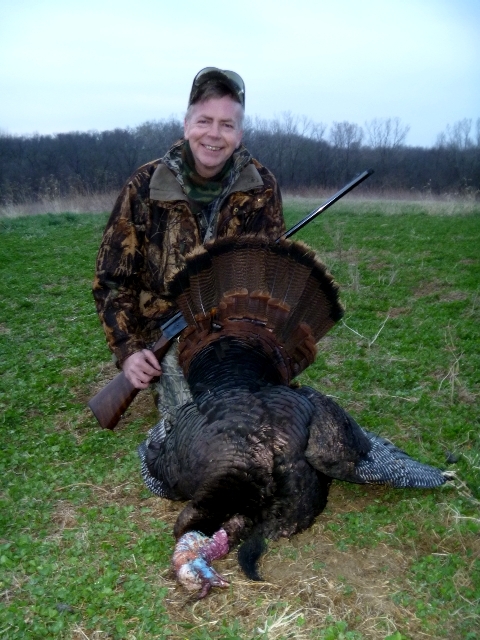 It is an ideal platform for a gobbler-whacker with very little effort. The bore of this A-5 as received was .616 inch inside diameter. The barrel was sent to Mike Orlen for screw-choking. Mike installed one standard flush Trulock Tru-choke at my request, so it is still just as appropriate for bore-sized slug use as before. It is better as a turkey gun, though, as saboted slugs for fully rifled barrels have largely obsoleted lead slugs. Off to the pattern board with a Trulock Precision Hunter Extended Turkey Choke, Tru-choke Style. The Trulock P. H. extended tube, number PH20575, has an exit diameter of .575 inch as you can tell from the part number. That yields a constriction of forty-one thousandths in this A-5 20 Mag Miroku barrel. A Belgian barrel wouldn't be a good choice here, as they are rated for lead and lead-like shot only, meaning Nice Shot or Kent TM for example. The Trulock choke doesn't care, but no choke at the muzzle changes the metal of the parent barrel itself or its forcing cone. The beauty of updating an A-5 20 Mag for this application is that, with an essentially dry magazine tube and the full complement of dual friction pieces installed, it is better equipped to handle the Federal 1-1/2 oz. payload Heavyweight #7 loads than most autoloaders out there. Also, with adjustable iron sights, any potential point of impact issues are largely non-starters, as you can always move your pattern. The Federal Heavyweight #7 load 20 gauge three inch shell, discussed in other articles in detail, is the ballistic equivalent of #5 lead (actually better) due to its superior density of 15 grams per cubic centimeter. This load has approximately 337 pellets, more than a typical 1-7/8 oz. three inch 12 gauge #5 lead load. This is actually just under the approximately 342 pellets in a 2 ounce 12 gauge #5 lead load. Spring has teased us a bit in Northern Illinois, but has yet to fully arrive. With the Iowa turkey opener in a few days, despite windy range conditions and intermittent rain, patterning is mandatory. The farm where a lot of my shooting and testing is done is an hour and a half south of here. Just because weather conditions seem reasonably good here has nothing to do with what is going on a bit south, I can tell you that. Three hours of video were edited down to a more digestible six minute YouTube production to give a few examples of the results. I didn't bother to try to include all the shells that patterned poorly as no one seems particularly interested in what doesn't work, only in what what does. An A-5 20 Mag properly set up is the softest shooting twenty gauge I've ever fired. With both friction pieces in place and an essentially dry (very light oil film) magazine tube, 1-1/4 oz. Fiocchi Golden pheasant loads didn't come close to cycling the gun. Recoil is essentially non-existent, as it was with a variety of other 1-1/4 oz. loads, 1-5/16 oz. loads, and the Federal 1-1/2 oz. loads. There aren't too many twenty gauge shotguns you can fire all day from the bench with 1-1/4  1-1/2 oz. loads and feel no discomfort. This is something I've done on many occasions and this is the case with a properly set-up A-5 20 Mag, all three of them that I regularly shoot as a matter of fact. Not one of them has a recoil pad: it simply is not needed. Though the patterns were well-centered, the gun threw them six inches high. With rifle sights, holding six inches under is child's play. Naturally, you have a far more precise sighting system with iron sights rather than just shooting off the bead. In this case, holding two inches below the base of the neck and you're more than good to go. There are no standards for turkey patterns. Some folks tell you a ten inch circle, many folks (and targets) show an eight inch circle, and so called turkey championships sometimes grade targets based on a five inch circle. Some talk of evenly dispersed pellets, though I have never seen a single pattern in my life that is evenly dispersed. Many commercial turkey patterns have a big red bull's eye on the head of the turkey, though that is completely wrong as far as I'm concerned. The bull's eye on a turkey is the center of the neck, not the head at all. The entire neck is quick, exposed kill zone, not just the head, basic biology should clue us in on that. Out target is the vertical center of the neck, with good pellet population to the left, the right, above, and below the neck center for turkeys aren't frozen in a stationary position and it takes very little breeze to get a couple of inches of wind drift past 40 yards. All this is taken into consideration for one shot, one kill, lights-out turkey hunting. 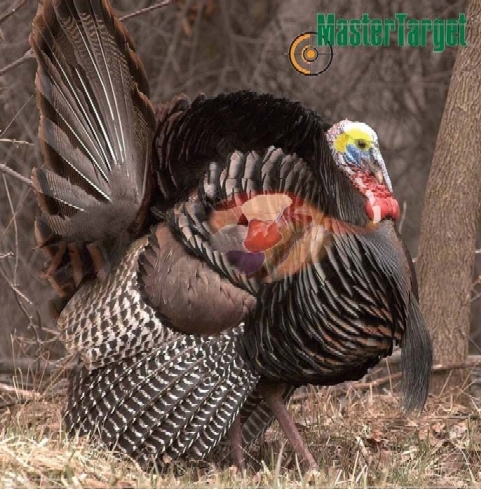 The "Master Target" turkey target gives a better representation of a turkey's vitals than most. The National Wild Turkey Federation says 40 yards is the maximum range to ethically and cleanly kill a turkey with a shotgun. There is no basis for a statement like that, none is given, but they can say whatever it is they want to say. As long as you have an inch and a half of penetration and sufficient pattern density, the ethical range limit is limited by the individual's ability to place that pattern. With some load and choke combinations that may be 25 yards, with others it may well be 50 yards or more. That is, of course, why we pattern, why we practice, and why we consider wounding ballistics for a particular combination . . . to discover all this for our own unique combination of shotgun, shell, and choke. 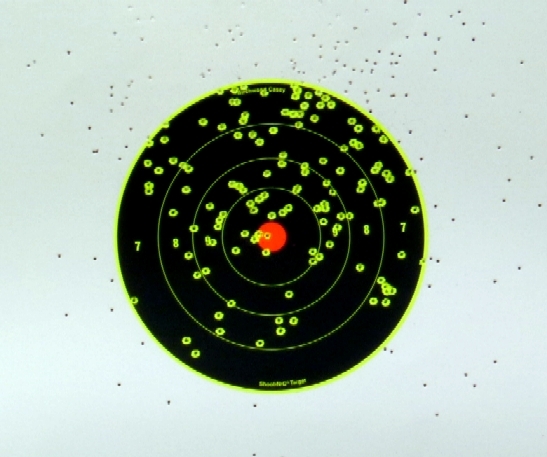 I can say that beyond forty yards, patterns can decay surprisingly rapidly in five yards increments so it takes a lot of shooting to determine what is consistently good at longer ranges. One shot groups don't mean much with rifles and one shot patterns don't mean much with shotguns. Five patterns are generally sufficient, though of course ten patterns are better. It isn't about the patterns we have thrown, it is all about the single pattern to be thrown in the future on a turkey. So, we are predicting through patterning and the more patterns we use as a guideline, the more accurate our prediction is likely to be. I've enhanced the contrast a bit for you on this thirty-three yard Trulock Precison Hunter / Federal Heavyweight #7 / Browning A-5 20 Mag pattern, the same one captured on the videoclip. This Birchwood-Casey target is an 8 inch diameter ShootNC®. Though far more density than needed at thirty-three yards it still holds up well at forty-five yards. This combination populates a kill zone better at fifty yards than many choke / load combinations are capable of at thirty yards. There are many different ways to look at a patterns, it still only take one pellet to kill a turkey. However, there is no glory in minimalist hunting as that is thinking of the hunter, but not the hunted. When it is only one shot on a glorious gobbler, it just makes sense to use the best stuff you can get your hands on. Once you try Federal Heavyweight loads out of a good choke, you might wonder why people would bother lugging 10 gauges or 3-1/2 inch 12 gauges around? Horses for courses and all that. Regardless, this is a marvelous combination for the modern turkey hunter. Monday, April 11, was the Iowa opener, and this twenty-eight pound Tom was the satisfying result.